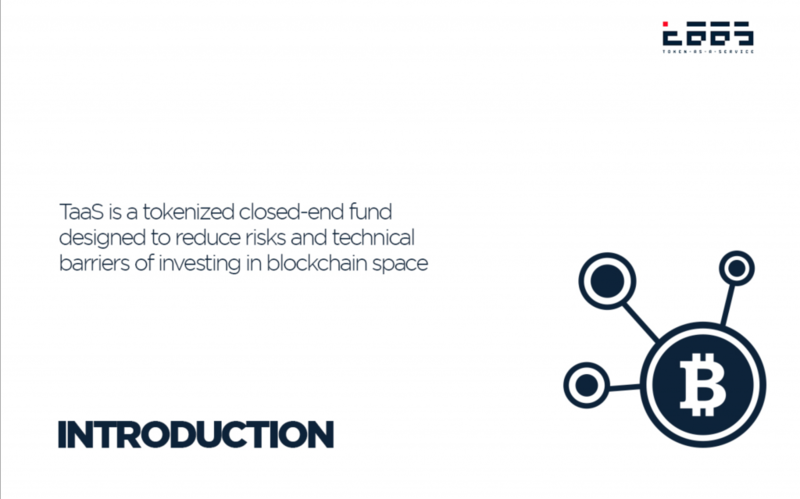 Token-as-a-Service (TaaS) is described as a closed-end fund designated to blockchain. The goal of TaaS is to reduce risks and eliminate technical barriers for those that want to invest in blockchain. Other goals are to expand market understanding, and increase transparency. Token-as-a-Service as a business model is a transparent fund consisting of cryptocurrencies and tokens. Instead of investing in a fund that is managed by human managers, TaaS allows investors to gain capital through the rise of the blockchain markets. It does this by removing technical barriers that prevent people from getting into cryptocurrency trading. Token-as-a-Service works like a company that is going public through an initial public offering. The company sells a limited number of shares at a set price. They enter a stock trading market and the price of the stock fluctuates based on perceived value of the company through its business, products, contracts and management movements. Token-as-a-Service is currently in its IPO phase, called an Initial Coin Offering (ICO). That makes TaaS a closed-end fund as there is only a single investment period. Once that is ended, investors are then owners of tokens and these tokens grow in value over time. This give the investors the ability to gather quarterly profits equal to 50% of the total profits for that time period. Another 25% of the profits are automatically reinvested into the fund. This eliminates the need for further investment. It also means that each token rises in value over time. Smart Contracts are how TaaS offers payout distribution in an honest and transparent way. Because the Token-as-a-Service fund is run with its own Cryptographic Audit (CA) technology, it means anyone, whether they are an investor or not, are able to track trading history and fund portfolio balances via Proof of Reserves, Regular Blockchain Snapshots and APIs that allow for viewing of the data. TaaS is building Kepler which is its own cryptocurrency portfolio management and analytics. Kepler’s development will be funded by TaaS profits and the first phase is set for beta in the second half of 2017. Kepler is designed to help in the following areas. The Token-as-a-Service Cryptographic Audit is being created through a partnerships with Ambisafe. That is an Ethereum platform. The CA removes escrow, gives investors better control over the profits, and transparency of the capital distribution. Token-as-a-Service investors have little to no risk through several features including the transparency previously discussed, the building of the TaaS Reserve Fund, and the smart contracts. The smart contracts determine how and if capital is disbursed based on TaaS growth, or in the case of a loss. The Token-as-a-Service Reserve Fun will be built from 10% of the ICO funds, and 25% of profits reinvested quarterly. It will include a low-risk investment in Bitcoin (up to 30% of the reserve fund) for constant liquidity. The Reserve Fund will never be less than 10% or more than 30% of total portfolio size. This gives TaaS enough capital to liquidate some memberships in case of market panic due to Ethereum blockchain collapse. Token-as-a-Service will be the first closed-end fund with the ability to provide a continuous return on its Initial Coin Offering. It ensures that there is always capital in the fund and there will be no further investment after the ICO. Those who invest in the ICO are also given one year of free access to Kepler. The token they receive as part of the ICO acts as a Proof-of-Membership (PoM). The tokens, once issued, will be able to be traded on all cryptocurrency exchanges if an investor desires to sell theirs. This is equivalent to cashing out of TaaS by selling their PoM token, presumably for a profit.